Happy Halloween, we have had a ton of kids out Trick or Treating. It is a wonder I was able to complete my Mojo Monday Challenge :) with all the knocking and door bell rings. I will admit that this card is bright and busy, not something I can accomplish very often. Today I like it, maybe it is all the candy I have been sneaking from the treat bowl. 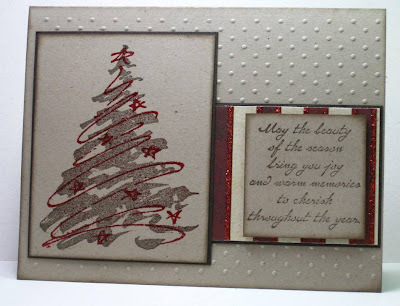 I used multiple pages from My Minds Eye - Wonderful Winter Christmas glitter Paper. There is all sorts of little bits of glitter all over the DP. I cut out a tree from one of the pages and popped it up with foam tape. I also added just a little twine and a couple of gems. 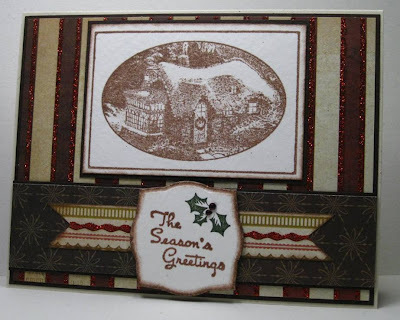 Supplies: Cream and red cardstock, My Minds Eye - Wonderful Winter Christmas glitter Paper, Hero Arts-Merry Christmas, sew Easy Fancy Floss, Recollections Gems. Hello All, hope you are having a wonderful Sunday. The house is clean, I am working overtime on the laundry, the weekly grocery shop is also done and dinner is half way there. The next couple of hrs are all mine. The weather is definitely questionable out there so it is a perfect time for me to indulge in carding. 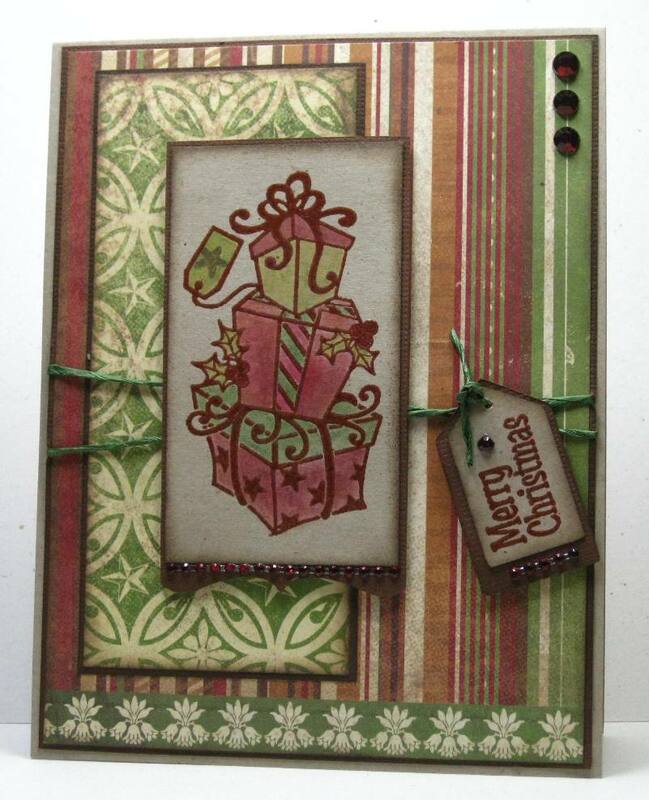 patterned paper, a stamped image, an embellishment, part of the background, the focal point,...you get to decide!" I ended up with two cards for this challenge, the first card passed simple after I cut out the first flower petal. Does this look like a half a flower, or maybe just a Turkey tail :). Ahh well, if you can't laugh at yourself. 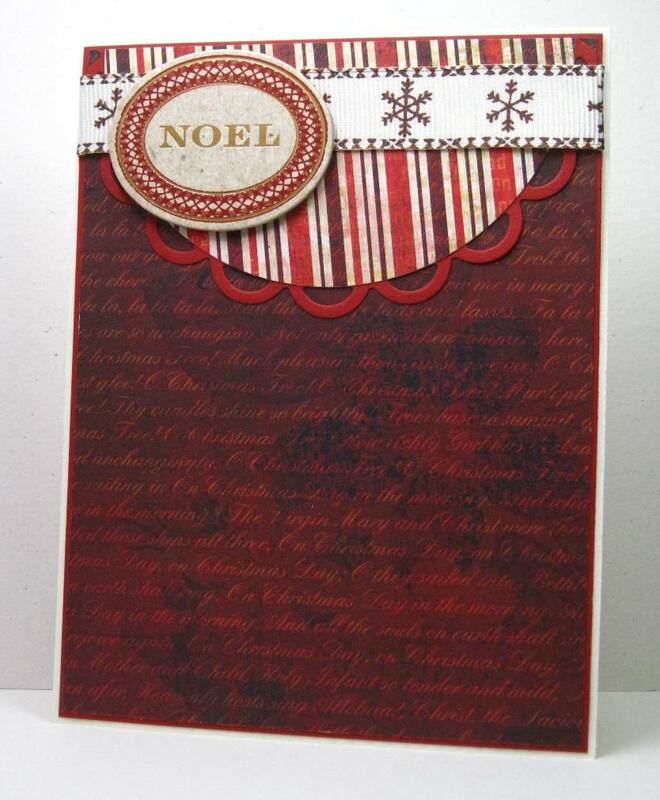 I used the same Designer Paper for this second card. I will call the two cards a set :). 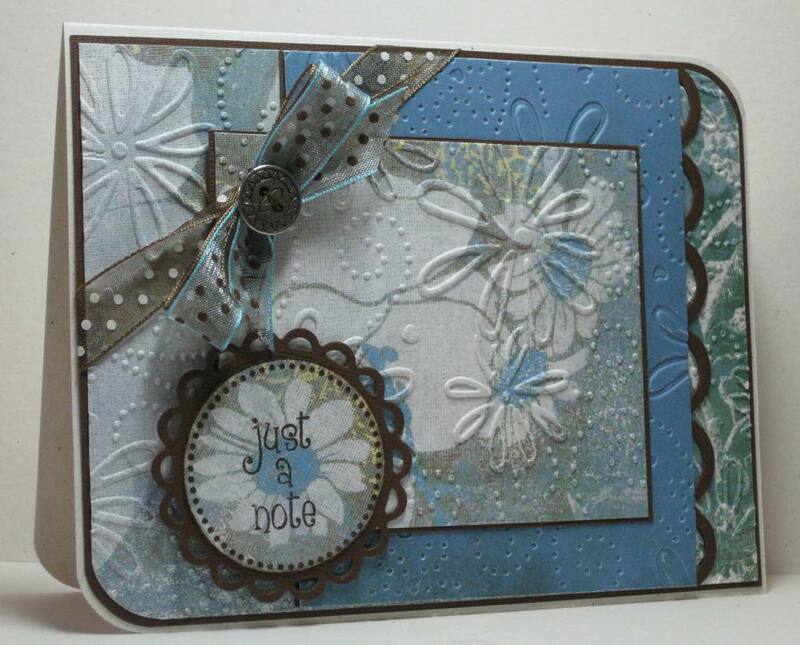 I added a little sparkle to the bottom of the card with some Stickles. Supplies: Cream and brown cardstock, Designer Paper- My Mind’s Eye, Technique Tuesday-Loves me Still, The Stamps of Life-Daisy, TPC Card Crafting – Thank you and Hello, Stickles, Glitter Dots, misc ribbon. Enjoy the remainder of your Sunday, if you stop by please leave a comment. Hello again, another quick post. I have a friend who has a birthday coming soon, being as our birthdays are within days of each other we always go out for a ladies birthday dinner. This year for her birthday I am not used much in the way of imagination for her gift but chose something that would be enjoyed. 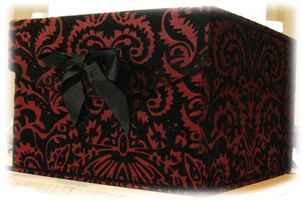 This beautiful box is about 8 inches square and about 6 inches tall. The black parts are all velvety. Inside is tissue wrapped decadent mixed dark chocolate bars and tea. 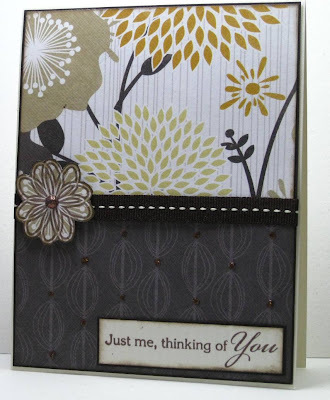 I tried to make a card that would almost match, I have some of the beautiful velvet designer paper, I am not sure who makes it but I brought it from Paperwishes. I cut the black cardstock with my Cricut. 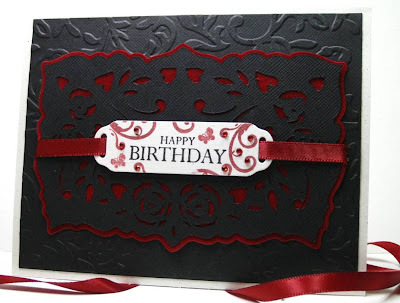 Supplies: Natural white and black cardstock, Designer Paper – Unknown, Gina K Designs – Happy Birthday, Maya Road Clear Stamps, Cricut-Botanicals, Spellbinders Nestabilites, Cuttlebug folder, Recollections Gems, Fabricland ribbon. 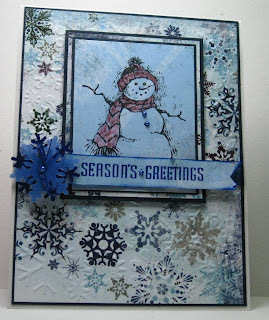 Clean and Simple Stamping has posted the sketch for challenge 164. I could not get a good angle for this card, this little banner does not lay flat but is raised in parts with some foam tape. I love this double-sided DP, it makes me think if snowy walks and making snow angels. 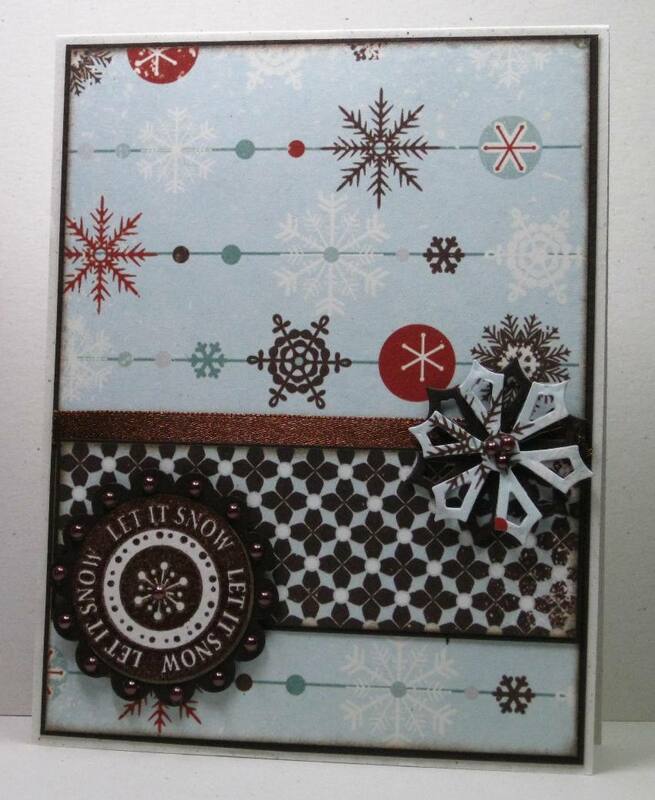 Supplies: Natural white and navy cardstock, Designer Paper-Bo Bunny, Inkadinkado-Snowman, Cornish Heritage Farms- Seasons Greetings, Cuttlebug folder, Creative Impressions-Medium Snowflakes, misc ribbon and pearls. The Friday Mashup - Recycle, Renew and Reuse. I can not believe that today is the last Friday in October... where did this month go.. where has this year gone :). We are under 60 days now till Christmas. I don't want to think about it. 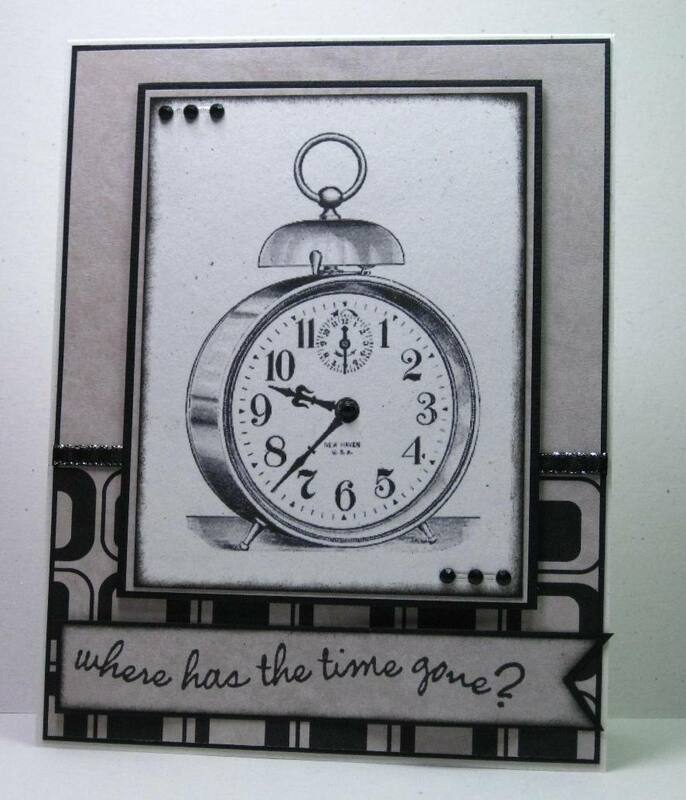 It is time for The Friday Mashup, it is all about ﻿Recycle, Renew and Reuse and a fabulous sketch by Heidi. Or Make a project using "Recycled / Repurposed Materials or Supplies". 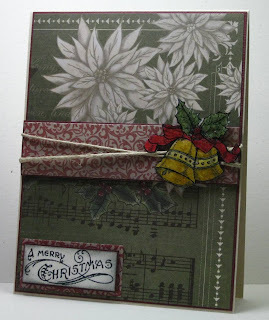 Or "Mash it Up" and create a project "Using The Sketch and Recycled /Repurposed Materials or Supplies". I dug deep I will admit, I was in my scrap bin. Lucky for me my scrap bin usually has some pretty large pieces in it. These scraps were actually from a project I started years ago and were still in their little baggie. The little bit of silver twine was also scrap that I had cut to short to span a card. Head on over to The Friday Mashup blog to take a look at all the wonderful creations whipped up by the Design Team. My time as Guest Designer has come to a close but it has been a fabulous 4 weeks. Thank you ladies for having me. 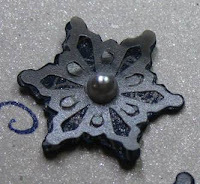 Supplies: Cardstock, DP and stamps-Stampin' Up!, Kaisercraft Pearls﻿, misc silver twine. Good Morning - It is chilly and dark out my window. Chilly for Victoria anyway at a balmy 3 degrees, I was scraping ice of my windshield rather then frost. 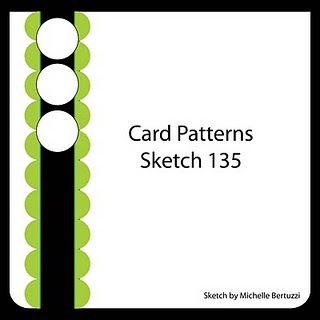 A fabulous new sketch was posted on Freshly Made Sketches yesterday, I started this card last evening but gave up when I found myself just staring at my supplies. It all came together this morning at about 5:40 as I was sipping my tea, my husband thinks I am crazy :) but that is nothing new. I have left this Designer Paper out so I can see it and my eyes are just drawn to it, maybe it is all that wonderful glitter. 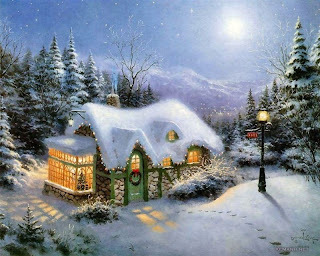 I have two of these stamps with Thomas Kinkaid images, I don't think I ever really do them justice. I have tried to colour them in the past but I was not happy with that either. They really are stunning images. Supplies: Natural Ivory and brown cardstock, Designer Paper- My Mind’s Eye, Silent Night Vignette and Vintage Christmas Expressions-Cornish Heritage Farms, Recollections Gems, Spellbinders Nestabilites. I have often used one of the fabulous images from over at The Graphics Fairy, but truth be told I had no idea about the Brag Monday Challenge. I found it today, and being as I needed a couple of masculine birthday's card in the next couple of months I thought "WhyNot". Supplies: Natural White and black cardstock, Designer Paper-Hot off the Press, The Graphics Fairy, Kelly Panacci-Time Flies, misc ribbon, Kaisercraft gems. It is time for a new Mojo Monday Challenge. Another fabulous sketch and I love all the wonderful layers. I have been having problem with one of my trimmers lately, it is one of those guillotine types, I am not sure how the silly thing is cutting crooked but I am pretty sure it is not me. I ended up cutting out this card twice. I now have lots of scraps.﻿ I am sure I can make a patch work something. I found this twine at Michaels this weekend, 40% off then a additional 20% coupon, can't complain about that, anyway it is a little thick but I was able to separate it to thin it out. I finished by adding a ton of gems. 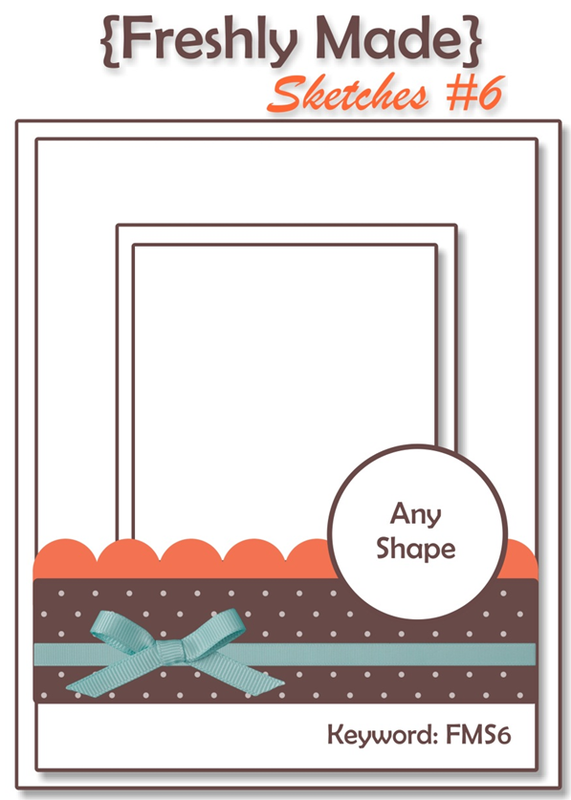 Supplies: Kraft and brown cardstock, Designer Paper- Kaisercraft, Hot off the Press-Small Stacked Presents, American Crafts- Merry Mint, Celebrate It twine, Kaiser Craft gems﻿. 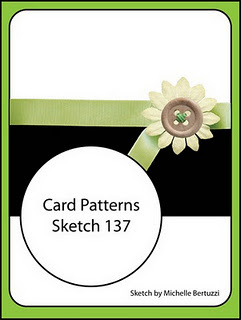 Card Patterns posted a new challenge, I was not entirely happy with this first card so I did a second one which I like a little better. 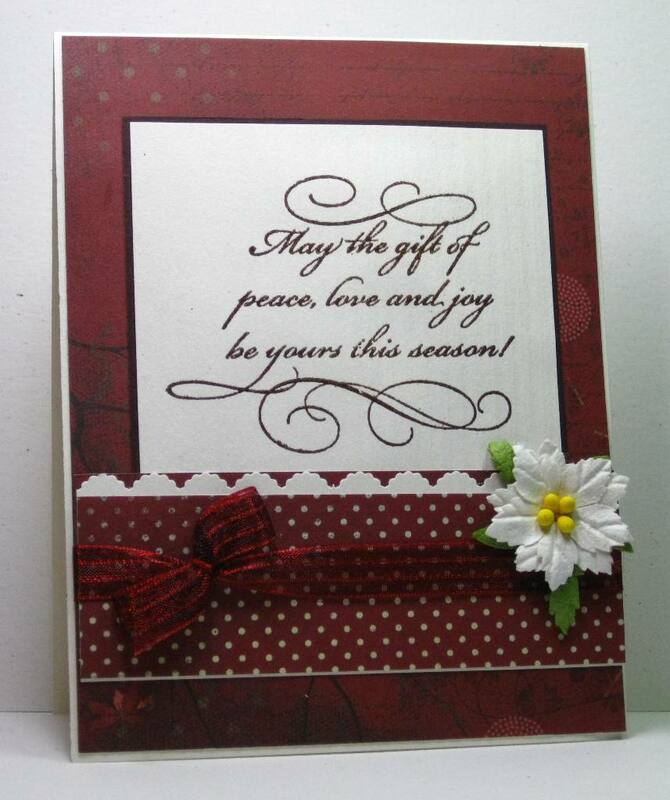 Every time I make a card with roses the song by Red Sovine - Roses for Mama often comes to my mind. My mom and dad use to listen to this version and the one by CW McCall all the time, I always cryed when I heard it. It still makes me tear up. 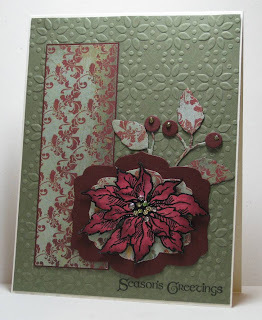 I saw these pretty little flowers on a couple of cards as I wandered blogs this week and I just wanted to try them. I have made a larger version but these small ones are so pretty. Supplies: Cream and burgundy cardstock, Designer Paper-Unknown, TPC- Happy Birthday, Kaisercarft. Super quick and simple and oh so fun to make. 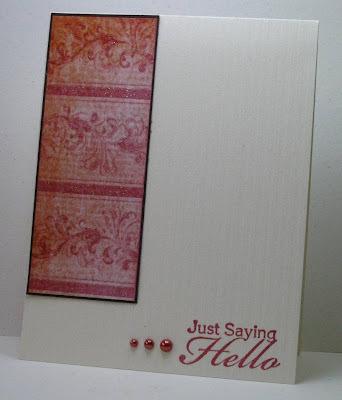 The new Clean and Simple Stamping Challenge was nice and easy. I started with Natural white cardstock and spritzed it with some Close to My Heart - Create a Shade Paint mixed with a little alcohol in mini mister﻿. 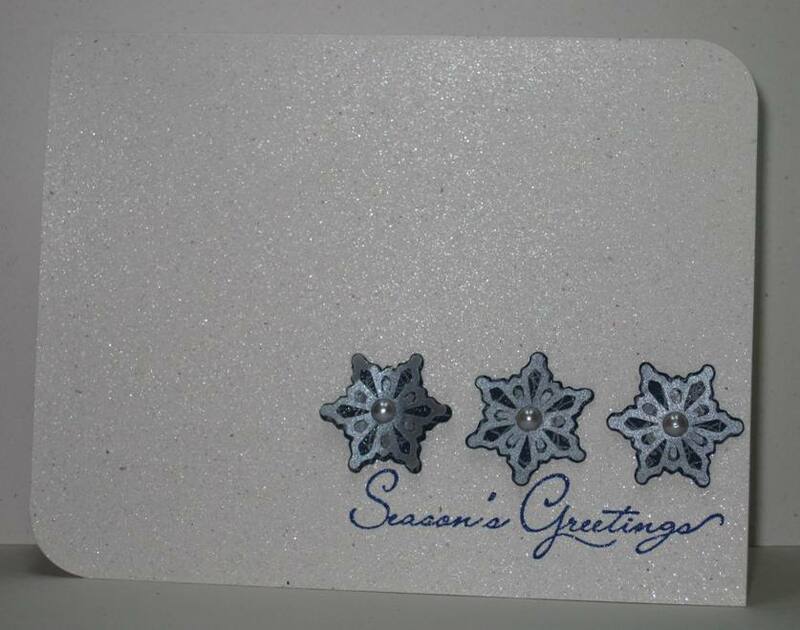 I cut my cute little snowflakes with my Cricut. I took the picture at a bit of an angle with odd lighting so that the shimmer would show..
and close up of a snowflake with lots of shimmer. 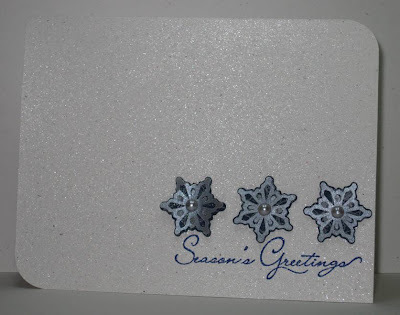 Supplies: Natural white cardstock, misc blue swirl cardstock, Silver vellum, Inkadinkado-Seasons Greetings, Cricut-Winter Lace, Close to my Heart-Create a Shade, Kaisercraft pearls. 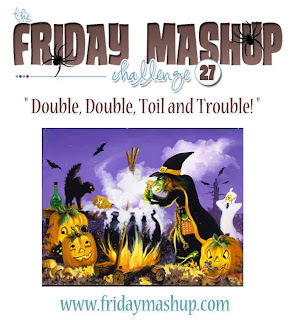 Happy Friday - It is time for another fabulous challenge over at The Friday Mashup. Make a project featuring "A Belly Band". Or Make a project using "Twine". 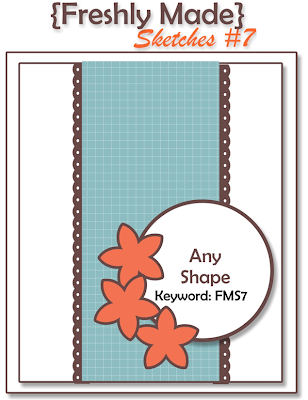 Or "Mash it Up" and create a project "Using Twine with a Belly Band". 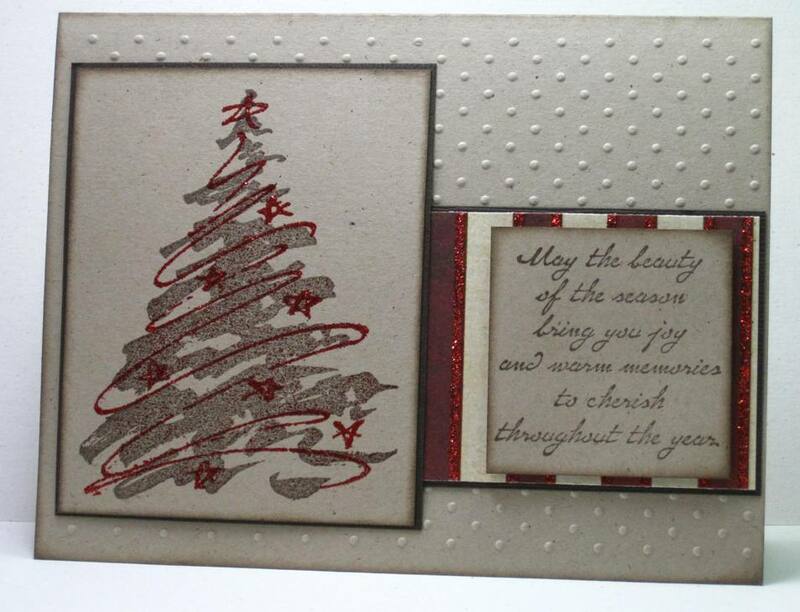 I am still working on my Christmas cards one at a time :). I know I will find the right one to duplicate at some point the key is to keep trying :). 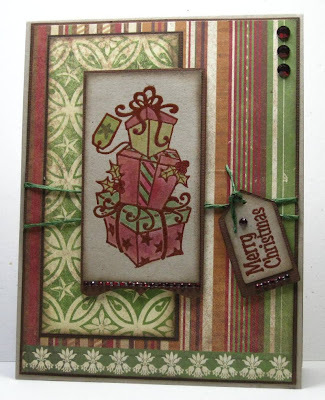 I stamped and cut out the bells, then coloured them with a mix of my Tombow markers, watercolour pencils and Spica glitter markers then heat embossed with clear embossing powder. I used plain hemp twine on my belly band. 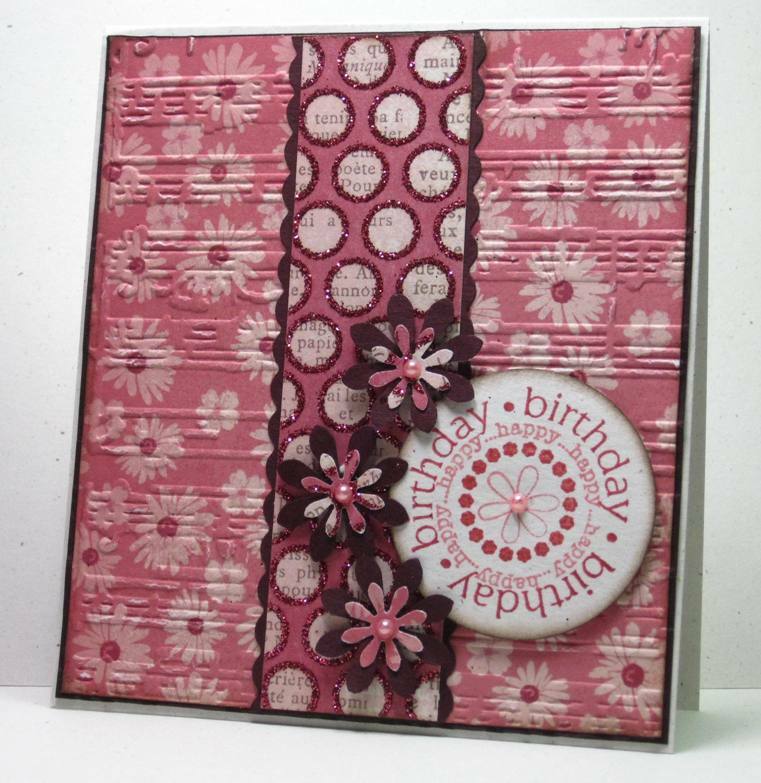 Jump on over to The Friday Mashup blog and take a look at the fabulous samples the Design Team has come up with. Have a wonderful Friday. 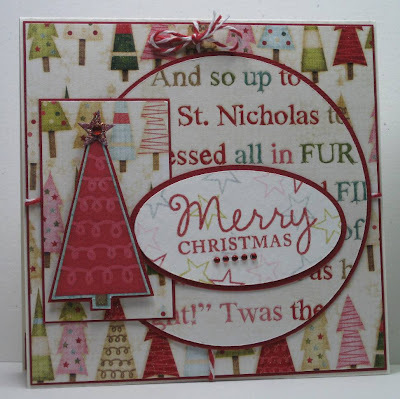 Supplies: All Supplies Stampin' Up!. Hello Wednesday :) this week seems to be clicking along quite quickly -- Ha say that 5 times fast. It is time for a new Freshly Made Sketches Challenge.. # 7. I tried this card about 6 different ways before walking away. That was before I actually tried working with a sketch. Obviously not a good idea today, my creativity needed a sketch. 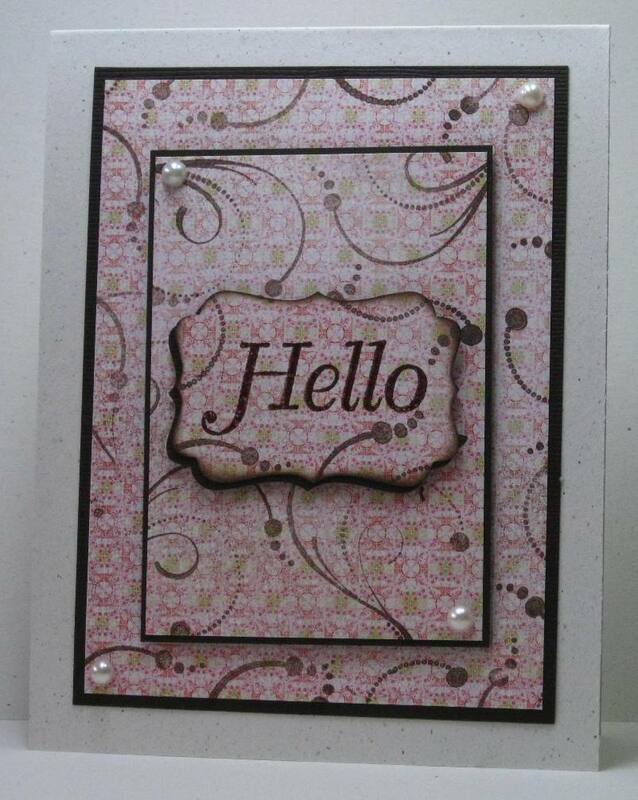 Isn't this DP pretty, double sided pretty pink.. pink is so not my color but I like the card. Supplies: Cream and burgundy cardstock, Designer Paper- My Mind's Eye, The Stamps of Life-Happy2beCircles, Misc punches, Kaisercraft pearls, Sizzix embossing folder. Hello Again, I am back for a second post today for Mojo Monday # 211- another fabulous sketch from Julee. Getting my Christmas cards done one at a time, I better step it up a bit :).﻿ This pretty little tree scene is from a stamp I picked up from the Craft swap a month or so ago, there is no logo on the wooden block just a random number, I love how I was able to sneak the sentiment almost in the tree line. 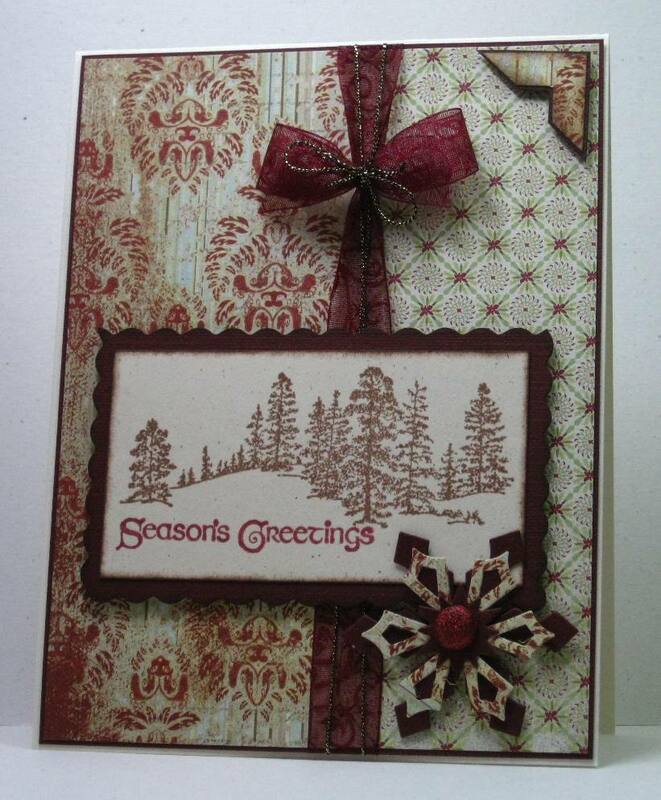 Supplies: Cream and burgundy cardstock, Designer Paper-Memory Box, Tree Scene- Unknown, Stampendous-Seasons Greetings, Spellbinders die cuts, misc ribbon, twine and brad. 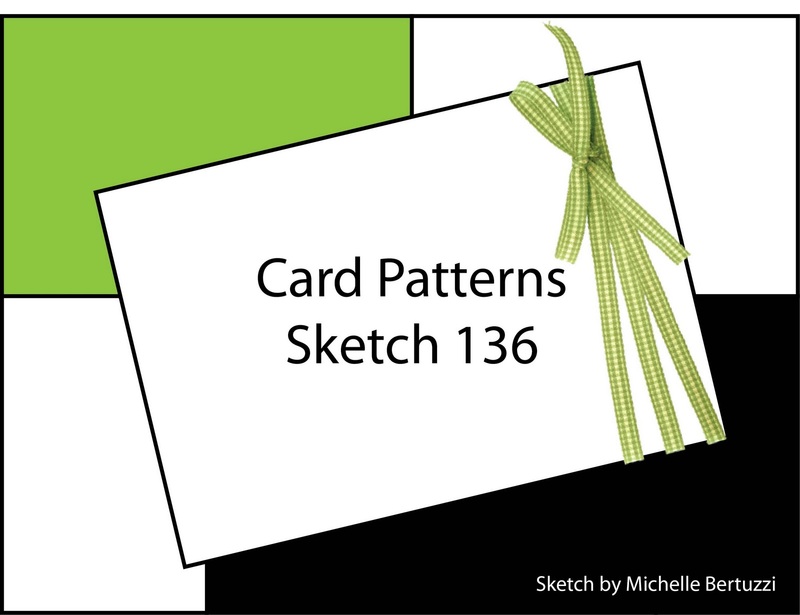 Good Monday Morning - Just a quick post this morning for the current Card Patterns Sketch. I am still trying to focus on Christmas. or at least winter that can pass for Christmas. Supplies: Natural white and brown cardstock, Designer Paper-Echo Park, Fiskars-Winter Wonderland, Spellbinders die cuts, Kaisercraft pearls, misc ribbon. A quick second post for today for the Clean and Simple Stamping Challenge. I seem to be collecting challenges, but I think I am pretty set with the ones that I have chosen over the last little while... for now anyway. I did a lot of sorting and putting things in there proper place in my craft room this weekend. I have been taking a look at all my scraps and decided I am going to try to use those supplies up while they are out. 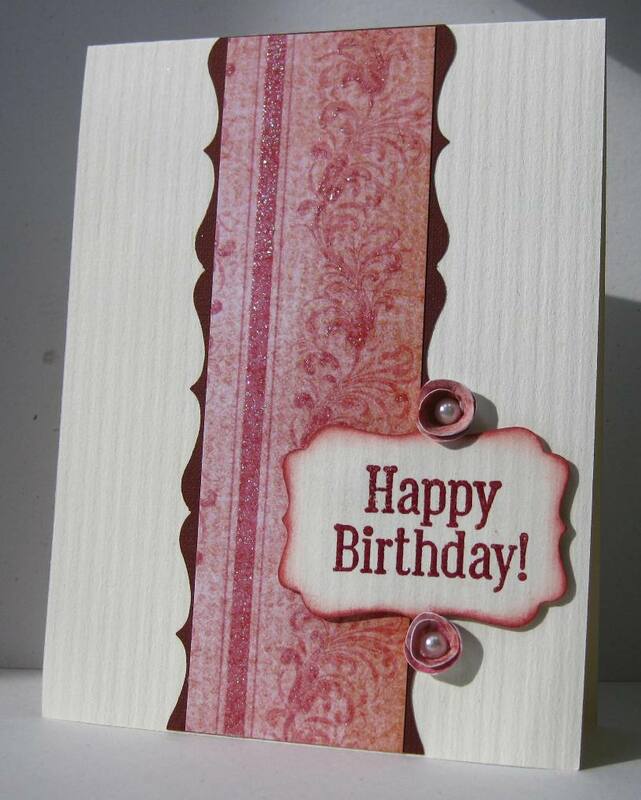 Which is why this card is the third one I have made in the last week or so with this DP. 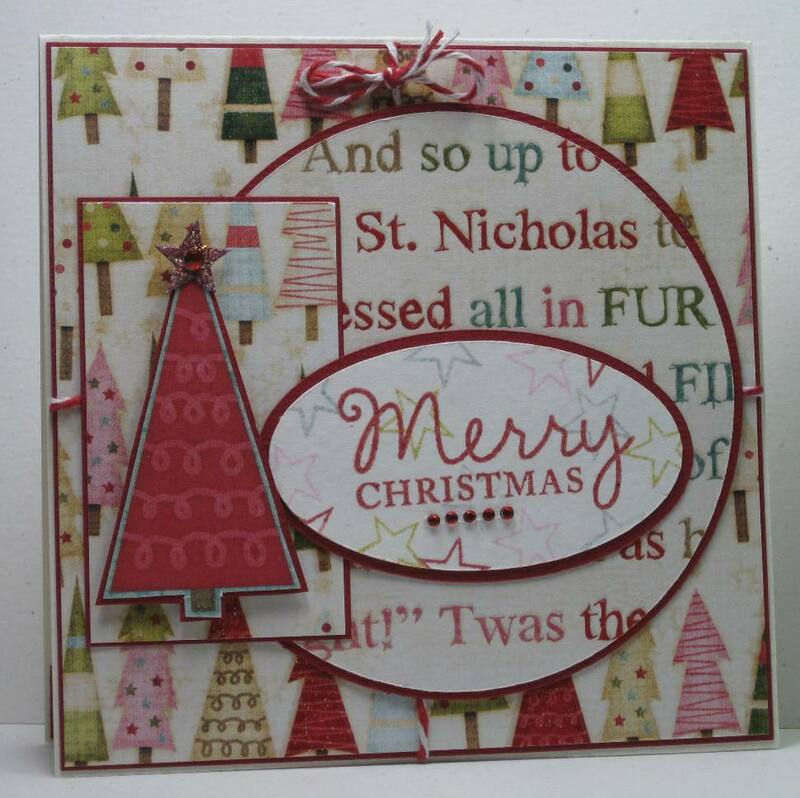 I have not used this stamp set in forever and being as I am trying to get a stash of Christmas cards as well I thought it worked perfectly. 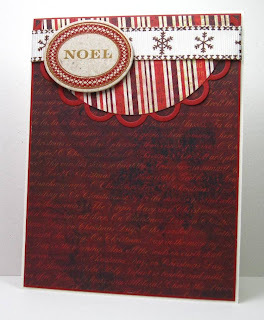 Supplies: Kraft and brown cardstock, Designer Paper- My Mind's Eye, Stampin' Up!-Solemn Stillness, Ranger-Red Embossing Tinsel, Cuttlebug-Embossing folder. THINK PINK! as long as it is Clean & Simple! This is in honour of Breast Cancer Month. I went with simple lines, I added some stamped flourishes to give it a little something extra then finished with a few pearls. Supplies: Natural White and brown cardstock, Designer Paper-Memory Box, TPC Card Crafting Hello, Inkadinkado-Dot Flourishes, misc pearls. It is a beautiful Saturday morning out there. We had a frost this morning... *sigh* time to harvest as many of the tomatoes as I can before the get frost bite. I am a little behind on a few of the challenges I like to follow. I still have time to join the Clean and Simple Sunday Challenge #23. I actually had to rework this one, I was not happy with the completed card so salvaged the parts and start over.. so much for simple :). The end result is very simple and clean and I like it. The challenge is Anything Goes - As long as it is Clean and Simple. ﻿Supplies: Cream and burgundy cardstock, Designer Paper-Unknown, TPC-Card crafting Hello, Kaisercraft-Pearls. Happy Friday and time for another wonderful challenge over at The Friday Mashup. Make a project featuring "Snowflakes". Or Make an "Easel Card". 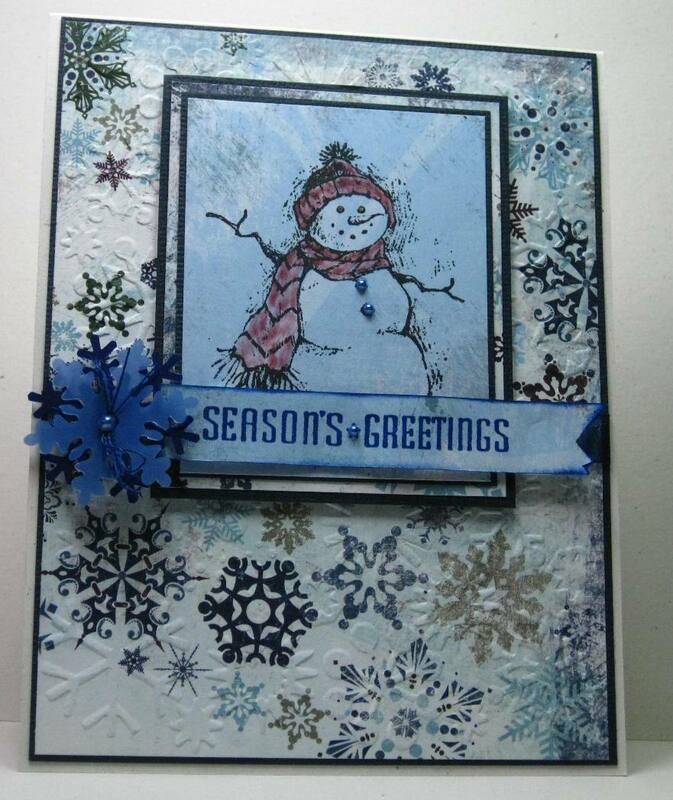 Or "Mash it Up" and create an "Easel Card featuring Snowflakes". I have made a number of Easel cards but I never can get the picture to show all the details. In this case all those little snowflakes are stamped in glitter. 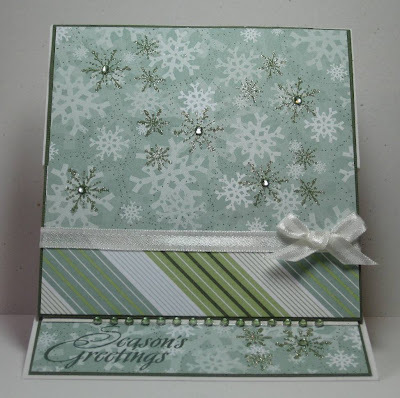 Supplies: All cardstock and Designer Paper - Stampin' Up!, Serene Snowflake - Stampin' Up, Glitter Ritz- Green Mist, Kaisercraft Gems, misc ribbon. 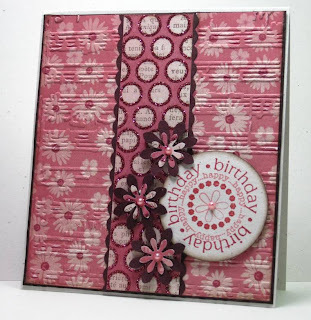 Hop over to The Friday Mashup blog and check out all the other fabulous cards made by the Design team and challenge participants. Have a wonderful Friday and do something creative today. 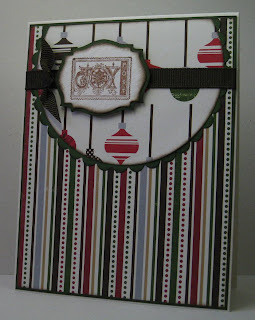 ﻿I had most of this card done right away, I was stuck on the bow and the shape. I could not seem to get my bow right so in the end I tied it with a small piece of floss to give it a little twist. 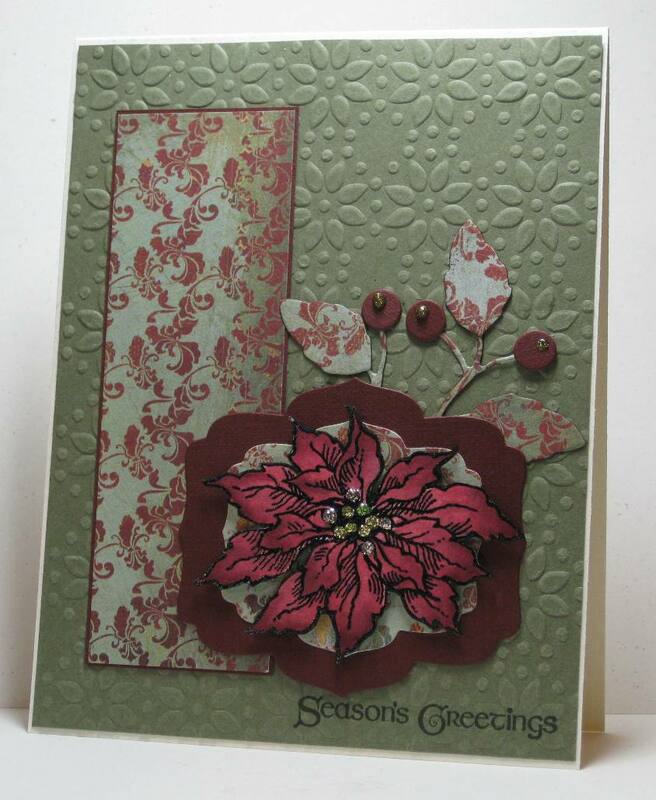 The poinsettia I have had in my stash for a couple of years and once I remembered I had them it worked perfectly for my shape. Supplies: Natural white and burgundy cardstock, Designer Paper- Memory Box, Penny Black-The gift of peace, misc ribbon, misc poinsettia. Good Morning and happy tuesday.. well it is a happy tuesday for me as I took and extended weekend. Today is just a quick post for the Card Patterns Sketch 136. 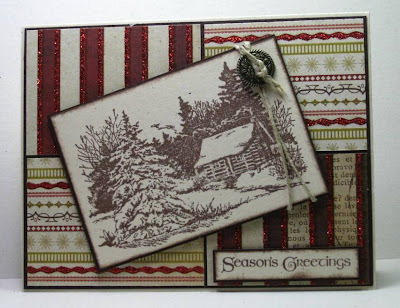 Supplies: Cream and brown cardstock, Designer Paper- My Mind's Eye, Inkadinkado- Winter Cabin, Stampendous- Season Greetings, Stampin Up! twine, misc button. Happy Thanksgiving to all my Canadian family and friends, its is also a great day for a Mojo Monday as the Turkey is cooking. 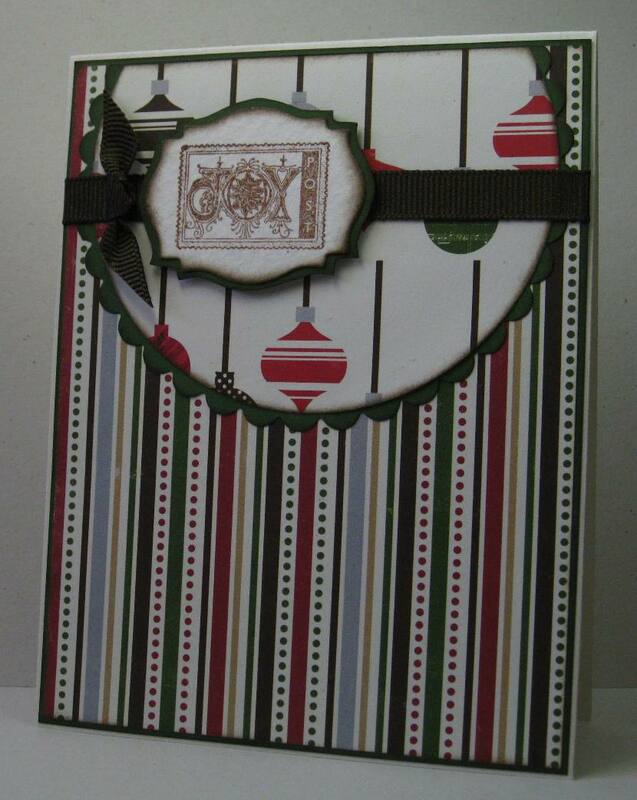 I found this wonderful Christmas Designer Paper when my sister and I did our marathon shopping adventure on Saturday. I could not wait to put it to use. Supplies: Kraft and brown cardstock, Designer Paper-My Mind's Eye, K&Company- Chipboard Christmas Cheer, Spelbinders-Die Cuts, Sew Easy Fancy Floss, K & Company-Gems. I was pretty happy that one of the stores that Barb and I were able to visit was Scrap and Stamp. I have ordered from the online store many times but it was fun to finally visit, thank you Kate and Judy for the wonderful visit. I am extra lucky today because I am spending the day with my Sister, I am probably on the ferry as this is posted (Love that timed post option) for a day trip. We are going to hit a few craft stores as we sister visit before I hop on the ferry home. 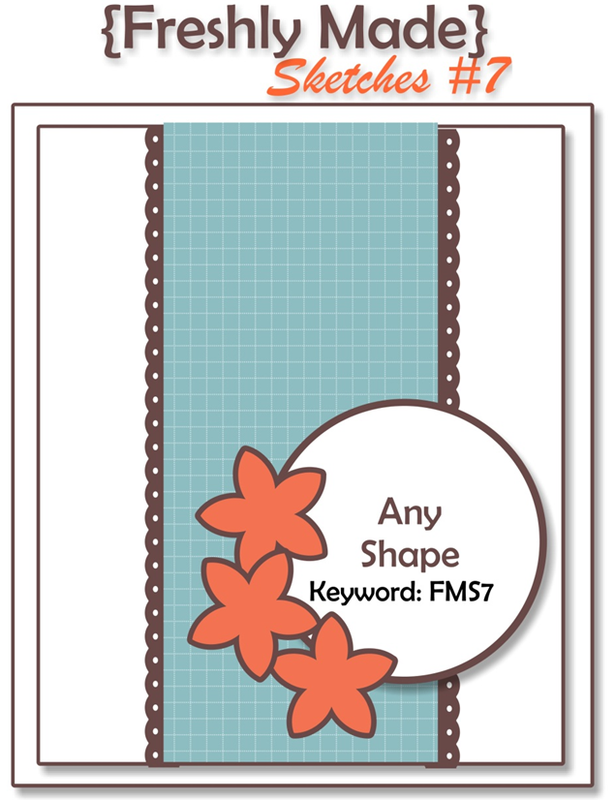 I actually made this card for a Card Patterns Challenge but I missed the deadline. This is the sketch. 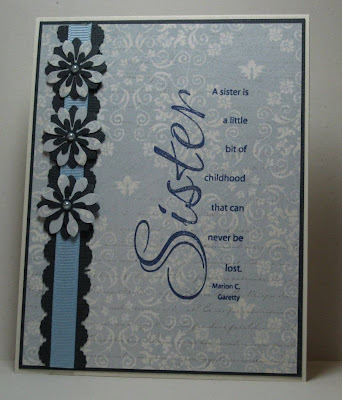 When I was at the craft exchange/sale a few weeks ago a lady was selling this stamp for super cheap.. I could not resist. I kept the card clean and simple. Supplies: Cream and navy cardstock, Designer Paper-Memory Box, Paper Inspirations-Sister Calligraphy, misc punches, A-Muse-Pearls, misc ribbon. Happy Friday, it is time for a new and wonderful The Friday Mashup Challenge. Take a look at my terrific new badge, I have been asked to be a Guest Designer for the month of Oct along with Michele K. from Michele Hearts Paper. What an honour to join the Friday Mashup team for a few weeks. Without further ado, here is the challenge details. Make a "Halloween themed" Project. Or Make a Project using the colors: "Black, Pumpkin Pie, Lucky Limeade & Concord Crush". 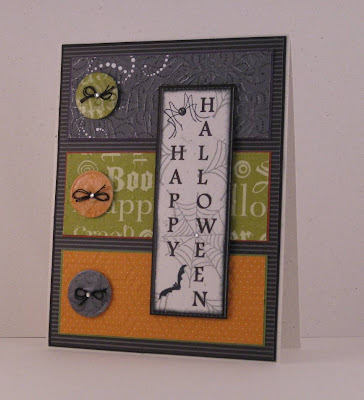 Or "Mash it Up" and create a "Halloween project using the Colors listed above". 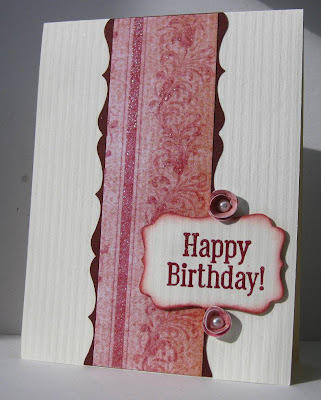 *With all of our Challenges that have a Stampin' Up! 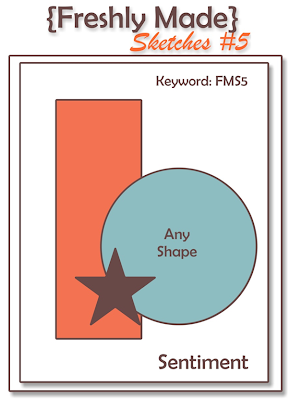 Color Combo, you may substitute any colors you have, with similar ones you have on hand. I have such fun with Halloween cards, why not send them out. It is another way if saying hi :), I don't care if you think you are too old to enjoy the ghouls and goblins, did it make you smile when you opened it? Well good :). I think I did pretty good with all the Stampin' Up! 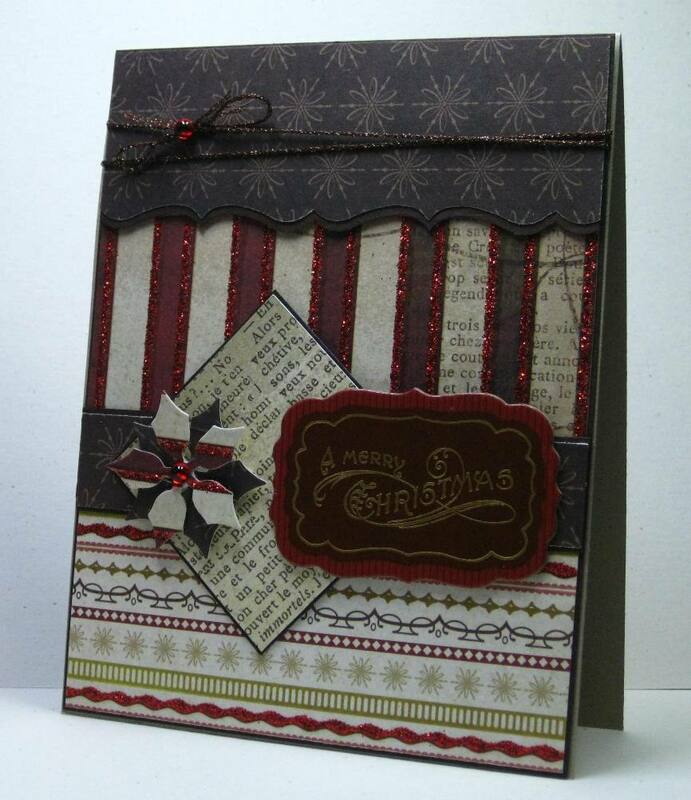 supplies, all cardstock, DP and button die cuts are Stampin' Up!. I did not manage the exact colors but I think I was able to pull it off. I added some texture to each layer and used the computer to print of the vertical sentiment. I love the new Sizzix Embosslits Sweet Buttons, I embossed them with clear embossing powder and added a wee little gem for sparkle. 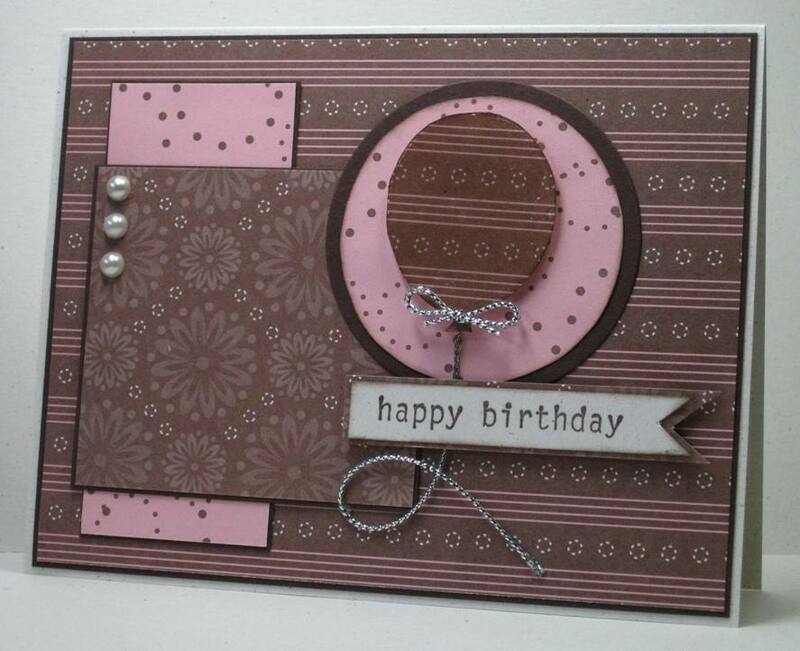 Pop on over to The Friday Mashup blog and check out all the other fantastic cards made by the Design team and challenge participants a like. Have a wonderful Friday and be creative. Good evening- this is a quick post for the new sketch for Freshly Made Sketches. I was determined to colour this poinsetta with my tombows, I popped it up with some foam tape and added stickles for a little sparkle. I must have tried 3 or 4 different leaves and branches before selecting this cute little holly branch. 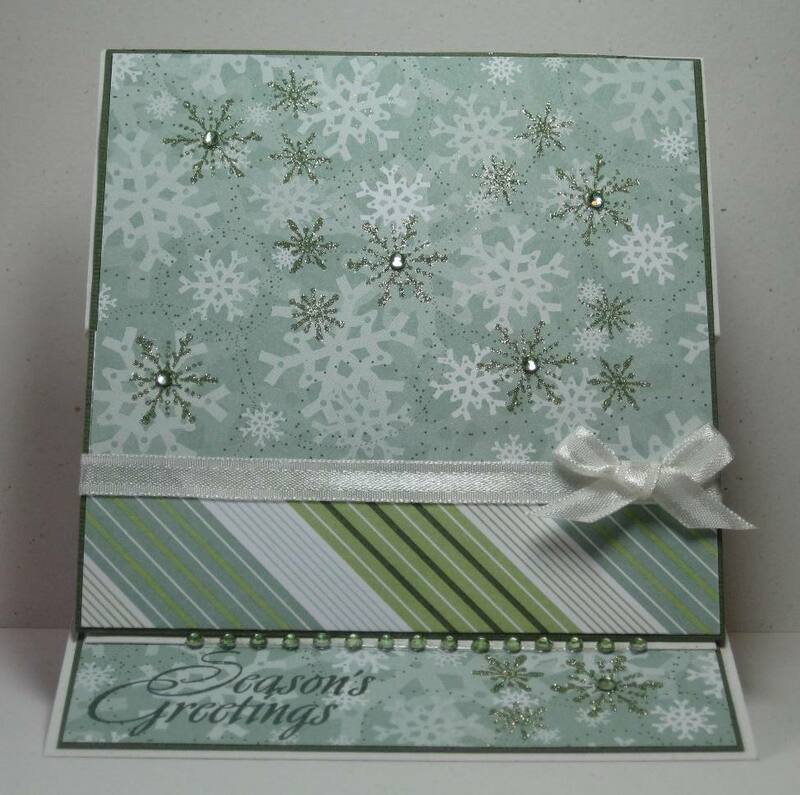 Supplies:Cream and green cardstock, Designer Paper- Memory Box, Stampendous-Holiday Greenery and Seasons Greetings, Memory Box and Spellbinders Die Cuts, Stickles. 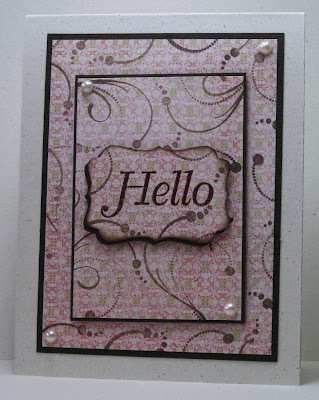 I have a Mojo Monday post today, I did start this card yesterday but I was not very happy with it. I have been wanted to use this Designer Paper for a couple of months now and I was determined. So when the card was not working I just walked away rather then start over. I am glad I did because today it all came together. This is this weeks Mojo Monday Sketch. 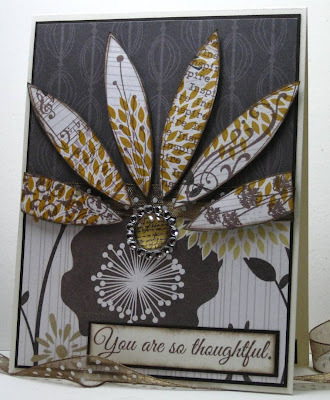 Supplies: Natural White and brown cardstock, Designer Paper-My Mind's Eye, The Stamps of Life-monogram2build, Spellbinders-die cuts, Crafts too-Embossing folders, misc ribbon and button.